Smile it's simple. 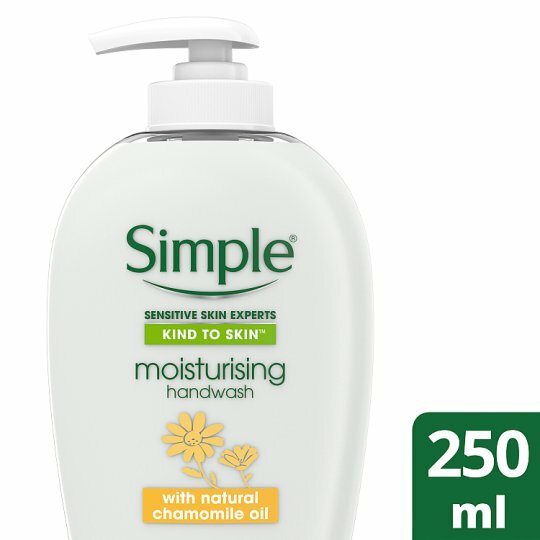 Simple have been the experts in sensitive skin since launching the first perfume and colour-free soap in 1960. We’ve stayed committed to our original philosophy of creating skincare and skin cleansing products suitable for all skin types with the suitable formulation, From this we have learnt that if something is as delicate and precious as skin, it deserves only the kindest care. Simple says no to harsh, no to artificial perfumes and colours that can upset your skin. Instead, we as a brand simple use only our purest possible, skin-loving ingredients, so you can trust all our products to be kind to sensitive skin. So choose to use our simple products and use our Kind To Skin moisturising Handwash. Simple kind to skin gentle hand wash is a caring hand wash for sensitive skin. A moisturising handwash with the perfect blend of ingredients to leave your skin soft and hydrated. Simple gentle hand wash is perfect for even sensitive skin. Our Simple Moisturising Handwash is Dermatologically tested. When using our simple moisturising hand wash for best results Apply our simple moisturising handwash to wet hands, then simply lather and rinse thoroughly. Caution, when using Simple Gentle care handwash Avoid contact with eyes.